The Youth Commission helps identify the needs of El Dorado County youth and communicate those needs to our local representatives. 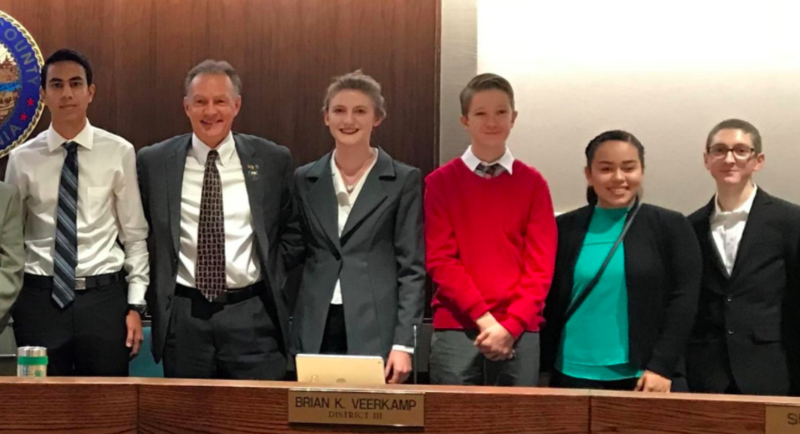 The Board of Supervisors and the El Dorado County Office of Education (EDCOE) co-sponsor the Youth Commission, which operates as a youth government. The students learn about local governance while gaining important leadership skills. Students will take the information and ideas developed at the dinner to improve their project of getting information about mental health resources into the hands of our county’s youth through development of a one-stop website. Pictured from left to right (from an earlier event this year) are Shayan Habibi, Supervisor Brian Veerkamp, Mackaela Pedersen, Everet Frame, Edith Rivera, and Chistian Seldon.